I am so pleased to have my mom, Judy, reviewing on Acting Balanced again! Every once in a while, a book crosses my email that just screams - send this one to Mom, and so far I'm two for three in getting it right on the nose... I am so pleased that she agreed to read this one and share it with you! This article is part of a Pump up your Book Tour and we received a copy of the book at no cost to facilitate the review. Media headlines abound these days saying, “Tea is trendy…” and we believe it until we read the first chapter of Ritual Tea: How the 9 Secrets of Tea Can Transform Your Life. Entitled, Tea’s Sordid and Holy Exploits, chapter one is a worldwide, whirlwind tour of tea history that leaves the reader knowing once and for all that tea has always been trendy for very good reasons. Next to water, tea is the world’s most popular drink. 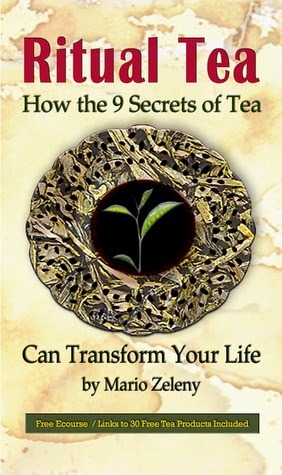 Author Mario Zeleny, lifelong tea lover and personal coach, extracts the magic of tea from its history, uses, and benefits but also from its power to change the world. He brings the secrets of tea into modern light, and makes it accessible for contemporary lifestyles. Ritual Tea boasts over 30 links to free tea products, ten personal rituals to help with everything from anxiety to sleep, and 10 charts that make crafting our own ritual a breeze. Discover the transformative power of tea hidden in its history, versatility, and essence through simple, timeless and individualized rituals. To help us on the tea path, the author has made a free Ritual Tea ecourse available through ArtSpellz.com. Tea has made a 5000 year trek to inhabit the world and in its wake it has altered not only individual lives but cultures and countries. Ritual Tea asks, “Who will we be in tea’s history?” Will we just make tea, or will we allow tea make us? I accepted the book to review because I am a consummate tea drinker. I have been drinking since I was very little. My grandmother always had a cup of tea for me especially when I was in trouble. It is a tradition that has been passed down for generations. I am now as a grandmother introducing my grandchildren to the pleasure of drinking tea. I found the book fascinating. The history of tea is amazing. Who would have believed that it was the cause of a lot of wars even beyond the "Boston Tea party". Making tea is a very integral part of the enjoyment. Mario takes this to a higher level and tells how it can improve your life. The book is written in an easy to read manner. Each segment is self contained yet makes you want to read further. I was pleased to find out that the making of tea is well defined and actually enhances the flavours. The reasoning behind the types of tea was important as well. I would recommend this book to anyone who likes drinking tea. Even a coffee drinker could change their minds after reading this book. Mario Zeleny – Lover of all things tea. Mario spent 15 years in healthcare and social services in clinical and administrative roles that offered coaching to employees and volunteers. An artist and entrepreneur from an early age, Mario now brings his love of writing, art, spirit, coaching and ritual together online at his creative living site, Sancti Spiritusand also from his transformational art site, Art Spellz. Mario looks forward to completing his education with Mentor Coach and St. Clement Seminary. He currently resides in Sacramento with his husband of 8 years, their children and their domestic sovereign, a pug named Brigit.